Charles MATTESON, of Providence, associate justice of the supreme court of the state, is a native of the town of Coventry, and was born March 21st, 1840. He is a son of Asahel and Julia M. (Johnson) Matteson, of Anthony. Asahel Matteson, a native of West Greenwich, was a merchant at Escoheag, afterward at Rice City, where the subject of our of sketch was born; and subsequently in the city of Providence. He now resides in the town of Coventry, where he enjoys the confidence of the people, and where he has held several important trusts. He was president of the Coventry National Bank of Anthony for ten or twelve years, trustee of the Coventry Savings Bank, and also state senator from that town for a number of years. Mrs. Julia M. Matteson is the daughter of Uzal Johnson, who was a resident of Lyme, Conn.
Judge Matteson received a liberal education, both in the literary and legal departments of learning, being a graduate of Brown University and a student of Harvard Law School. He took his preparatory course of instruction in the Providence Conference Seminary, now East Greenwich Academy, and in the University Grammar School, Providence, graduating from the latter institution in 1857. In the meantime he clerked for his father in his store in Anthony for two years. The opportunities here afforded the young student for reading character from the multitude of faces that came and went from that place of business, modified by so many conditions and circumstances in life, were not only educational in their tendencies, but the advantages herein afforded did much to qualify the judge for that high position he has so long and ably filled on the bench. In the fall of 1857 he was matriculated for Brown University and in 1861 he graduated from that institution with the degree of A.M. In the year 1861 he entered the office of Wingate Hayes, U.S. district attorney, and began the study of law. He was with Mr. Hayes two years then entered Harvard Law school. Here he remained another year and then returned to the office of Mr. Hayes, and on January 9th, 1864, he was admitted to the bar of the supreme court of the state of Rhode Island. From this time until his election as associate justice he practiced law, part of the time on his own account and then as a member of the law firm of Hayes & Matteson. His success at the bar gaining for him the confidence of his brothers in the profession led to his election as associate justice of the supreme court of the state February 11th, 1875. On February 28th, fourteen years ago, he took the oath of office qualifying him for the duties of the bench, and he has held that position ever since. August 2d, 1872, Judge Matteson was married to Miss Belle, daughter of Paul and Sally (Covil) Hines of Warwick. Her father was for many years superintendent of the Brayton Foundry at River Point. Three children were the result of this marriage: Archibald C., George A., and Paul. At the time of his marriage Judge Matteson resided in Coventry, and from that town was elected senator in 1871, and re-elected in 1872. In 1872 he removed his residence to Providence. His acquaintanceship with members of the general assembly, by reason of his recent service in that body, probably contributed largely to his election in 1875. In 1885 he erected his present residence in the city of Providence. 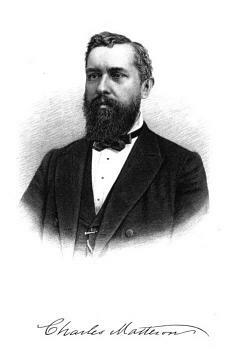 MATTESON, CHARLES, Associate Justice of the Supreme Court of Rhode Island. Born in Coventry, Kent County, R. I., March 21st, 1840. His father, Asahel Matteson, is a merchant by occupation, and has served his constituents al Coventry in the State Senate for several different terms. Politically, he is identified with the Republican party. The mother of Judge Matteson was Julia M., daughter of Uzal Johnson, a native of Lyme, Connecticut. The early education of young Matteson was received in a select school at Providence, taught by Miss Phillips. When five years of age his family removed to Centerville, in the town of Norwich. There he attended the. district school for about four years, until the family removed again to Coventry. Afterward he became a student in the Providence Conference Seminary—now called the Greenwich Academy— at Greenwich, R. I., and remained there for several years. His next step was to enter his father's store—that of a general country merchant—at Coventry, as clerk. Two years of dilligent and effective service in that capacity gave him a practical acquaintance with business, and constituted not the least valuable part of his preparation for future legal and judicial duties. Leaving mercantile pursuits, he re-entered the Greenwich Academy, studied there for a brief period, and then, in January, 1856, entered the University Grammar School at Providence, where he perfected preparation for matriculating at Brown University in September, 1857. At college he bore the reputation of being a close student, and graduated with credit to himself and the institution, as A.B., in 1861. Selecting the profession of law, Mr. Matteson next placed himself under instruction in the law office of Wingate Hays, Esq., then United States District-Attorney for Providence, and continued there about twelve months, reading law and preparing himself for a thorough course of tuition in the Harvard Law School. This he subsequently received, ami in January, 1864, was admitted to the bar. Beginning professional practice in Providence, he prosecuted his duties on individual account until 1865, when he and his old preceptor associated themselves as a law-firm under the title of Hays & Matteson. The partnership lasted until the 1st of July, 1871, on which day it was dissolved, and Mr. Matteson resumed individual practice, which he pursued until his appointment to the justiciary of the State in January, 1875. The oath of office was taken in the following month, and Judge Matteson assumed the exercises of his new functions forthwith. While in the local practice of his profession, Judge Matteson was the attorney for many corporations, and served as director and trustee of different corporate institutions in Rhode Island. As a judge his rulings and decisions bear the impress of entire impartiality, and harmonize at once with the spirit -and letter of the law. Judge Matteson was married on the 22d of August, 1872, to Belle, daughter of Paul Hines, Esq., a manufacturer resident al Warwick, Rhode Island. +--+ 5-Hezekiah Matteson,b.December 15, 1714,d.??? |  +--+ 4-Luranah Matteson,b.Abt 1750,d.??? |     |  +--- 6-John Nichols,b.1682,d.??? |  |  +--- 4-Edward Burleson,b.November 10, 1737,d.??? |     +--- 4-Susanna Bates,b.April 9, 1744,d.?? ?